All-in-One solution pack to view, print, review, edit, modify, protect, convert DWG DXF DWF drawings without the need for Autodesk AutoCAD or Adobe Acrobat. Print DWG, DXF, DWF drawings and designs to any printer with settings of your preferences such as paper size, orientation, copies, cropping print area, scale, offset, unit, alignment. You can preview the printing result before you print. Convert between DWG, DXF, DWF, PDF, SVG, and various image formats without the need for AutoCAD. The output image formats include BMP, JPG, JPEG, TIF, PNG, GIF, TGA. Enables you to convert between any versions of DWF, DWG and DXF files, and allows you to convert DWG or DXF files to PDF format without the need of AutoCAD or Adobe Acrobat. Supported DXF version ranges from AutoCAD 2.5 to AutoCAD 2012. DWG DWF version ranges from AutoCAD R9 to AutoCAD 2015. Load and save AutoCAD 2017/2016/2015/2014/2013/2012/2011/2010/2009/2008/2007/2006/2005/2004/2002/2000/R14/R9 DXF, DWG, DWF documents. In one word, Easy CAD Solution Suite combines all the features and functionalities of all Benzsoft software products. 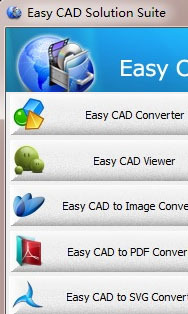 Easy CAD Solution Suite is shareware, and you can evaluate it for up to 15 days. When the evaluation is over, you are opt to buy the full version of the software or remove it from your computer. The full version of Easy CAD Solution Suite can be obtained online after you pay the registration fee and get a license from one of our resellers worldwide.